According to modern sports coaching theory, all sports training involves two major aspects - tactical skills and technical skills. In golf, tactical skills would mainly involve course management, but could also include golf set make up and customization, and perhaps mental skills training. These aspect of golf can be trained by any coach or instructor with adequate credentials. However, technique is another issue altogether. Technical skills - in any sports movement - involves the planning of a movement which should be maximally effective, efficient and safe. That is, the movement should have the best outcomes (distance, direction and trajectory in golf), utilize the least amount of energy, and reduce the potential for injury. Surely this aspect of movement should be analyzed and taught by a movement analysis expert? One with a serious understanding of how the body and brain work to create movement? Especially in the 21st century, when we have access to so much research in a variety of sports sciences. Today, more than ever, it is important to plan movement around knowledge of all the most important human movement related sciences. What can a movement analysis specialist actually offer? Such a person should be able to look at a variety of movements, and with some basic experience of it, plus an understanding of the end-goals of the movement, understand how best to reverse engineer those goals (rather than merely looking at how the best players in the sport do it). As a result, during the forward movement, the body’s joints should be able to come together to make a fairly synchronized movement without too much (or any) effort on the part of the sportsperson. The reverse engineering would be at two levels - generic with respect to human joint capabilities and specific based on an analysis of each individual's particular situation. Having done an internship at ASMI, the world’s premier baseball pitching biomechanics research institute; some recent research for the women’s 2016 Olympics gold-medal winning sitting volleyball team; plus, of course, quite a bit of research on the golf swing since 1993, one point stands out. To impart the best technique needs serious outside-the-box thinking so we can break away from traditional movement concepts which were developed in a less scientific era, and have not yet been tested/researched from a whole-body perspective. In such a scenario, as in most others, traditional responses (based on the responder’s profession) might be about tightness of some muscles, or no backswing rotation, or too much arms movement. A more holistic approach would be completely different. The analysis might go something like this: Question 1: Which specific movement might be implicated in the rotator cuff impingement? When the arm abducts maximally, the humerus hits the acromio-clavicular arch unless it is externally rotated first, as seen in the picture on the right (a nice randomly googled reference with interesting information on the topic: http://www.dailybandha.com/2011/04/shoulder-kinematics-in-yoga.html). Question 2: Why is the arm not able to externally rotate more? Any movement with a “narrow” elbow i.e. a more flexed elbow is already more internally rotated than one in which there is more width. Question 3: How could the shoulder be positioned to be less internally rotated at the start of its forward movement? By having the upper-arm abducted to about 90 degrees and not getting any closer, during the rest of the movement. Question 4: If this tennis player is wider, what next? At least two biomechanists I know have said a longer backswing arc gives a person more time to develop greater acceleration. I’ve never agreed because extra distance alone cannot speed up movement - that needs a reduction of time to accomplish. And also, when human muscles get more forceful, they slow down, not speed up (force-velocity relationship of muscles). What the width will do for this player is that he will have more time for his arm to reach the shorter distance to ball-impact, because the arm will already be partway abducted and will mainly only need some elbow extension. Some of the time saved can be utilized in tilting his body away from the descending ball so that he gets some trunk elevation instead of purely arms elevation to help him reach the ball. This trunk lateral flexion also means the core will become engaged and the strong shoulder girdle muscles (trapezius, rhomboids) as well as strong shoulder muscles (latissimus dorsi and pectoralis major) can support the shoulder girdle and humerus better. When that happens, the arm will not be swinging at high speed on its own with its much smaller muscles. The powerful core muscles - the external and internal obliques might become involved too, thus stabilizing the entire torso for the arm to move comfortably off. 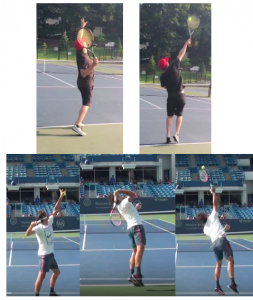 The pictures below show our intrepid tennis player versus Federer. Once these concepts and more, based on a personal and more detailed evaluation of the tennis player have been solidified, the tennis player’s existing coach can enter the picture with ideas such as using a lighter racket, or connecting the ball later during its descent or other such plans but the movement analysis specialist with an understanding of anatomy, injury, motor control and even biomechanics needs to make big picture plans first. The world probably has few people who have a solid education, not just good instincts, in these subjects, so more such specialists should be the focus of all sports teaching associations and organizations.